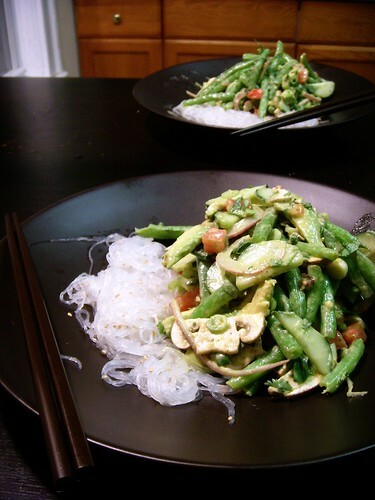 green bean salad with cucumber cilantro and avocado, originally uploaded by aarn! +9th January, 2009+. blanched and chilled green beans, diced tomato, thin sliced red onion, chopped scallions, sliced avocado, chopped cilantro, sliced cucumber. in a dressing of 1/2T. canola oil, 1T. white vinegar, 1T. greek yogurt, 1t. sriracha chili sauce, salt and pepper. served with cooked and chilled bean sticks, and topped with sesame seeds.